Is a black light bad for an african emperor scorpion? Recently found this forum. I bought a black light from my pet emperor scorpion. it doesnt seem to get hurt but peopel say it's bad. why?? is it really not ok? it looks very cool so..
Re: Is a black light bad for an african emperor scorpion? Think of a blacklight for your emp as the sun for you. Alittle is ok but too much is hurtful. Just like MillBrey said it's fine as long as it's only for a short period of time. 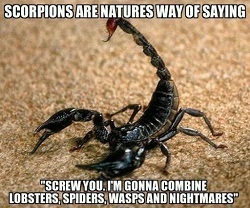 Scorpions don't like bright lights so keep them away from radiators and drafts. You might think it's shiny being exposed with UV light, but they live in both tropical forest and open savannas. These guys are used to burrowing beneath the soil and hides beneath rocks and debris, and also often burrows in termite mounds. Ohh.. but hey, what does that have to do with the light? I mean it sounds and seems to be okay man. He's a pretty comfortable! I don't know if it's rare or anything. I believe it's great cause he always runs around his tank (I'm not sure if he's a male! lol).